Sears has a new Clinique Free Gift with purchase offer! 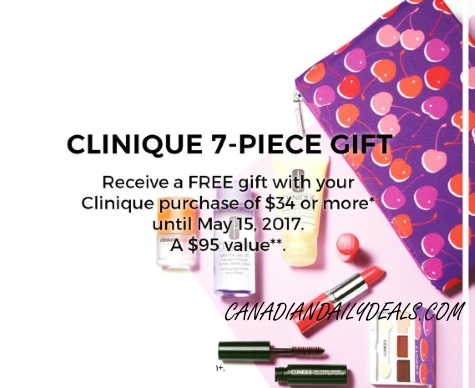 Get a 7 piece gift with your Clinique purchase of $34 or more! Gift includes: Happy Perfume Spray, Take the Day off Makeup Remover, Dramatically Different Moisturizing Lotion, High Impact Black Mascara, Eye Shadow, Lipstick in a coral colour. Offer is valid in-store and online until May 14, 2017, while quantities last. Click here to browse Clinique at Sears.